My resolution to use my cookbooks more doesn't just apply to new ones. I want to dig deeper into some of my old favorites too. 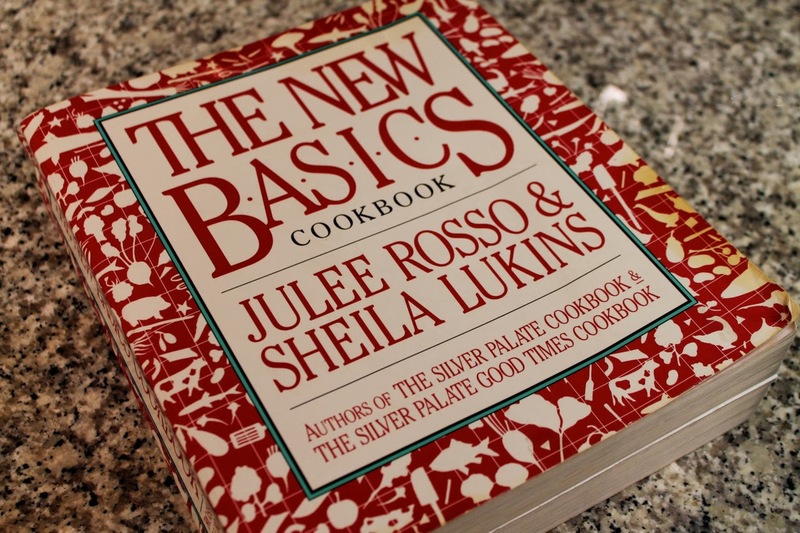 And there's no old favorite with a warmer place in my heart than The New Basics Cookbook by Julee Rosso and Sheila Lukins. You can tell by how worn the cover is that I've gotten some good use out of The New Basics Cookbook. When I was first getting into cooking as a high school student 20 years ago, this was the first cookbook I got to know well and it's influenced my cooking ever since. I was drawn to its Italian-leaning recipes, its emphasis on fresh ingredients and copious amounts of extra-virgin olive oil--all things I've embraced for many years. I've already shared recipes inspired by the cookbook that I've made for many years, such as Pasta Primavera and Grilled Chicken Fajitas. I'm also very fond of the book's recipes for pizza, pasta with quick-cooked tomato sauce and chicken brochettes. It's a great cookbook for comfort food, which is why I thumbed through it recently hoping to find a good winter chicken dish. 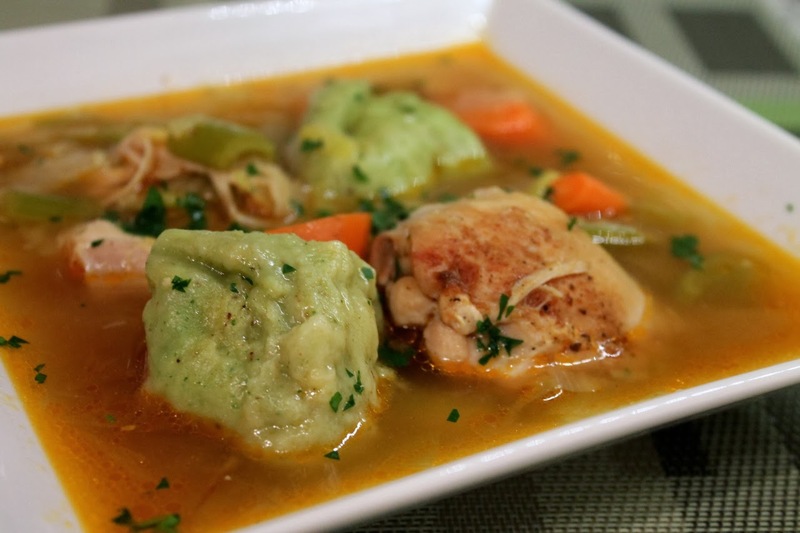 The first recipe in the "which came first" chapter (dedicated to poultry and eggs) is Chicken and Dumplings, which was just what I was looking for. We used to have this occasionally when I was a kid, although not this specific recipe. I made a few changes to the dish. Rosso and Lukins call for pouring off the vegetable oil after browning the chicken. Since I was using boneless-skinless thighs, there wasn't a lot of excess fat, so I decided to keep it in the pot rather than discard all that good flavor. I also used the fat to brown the vegetables. 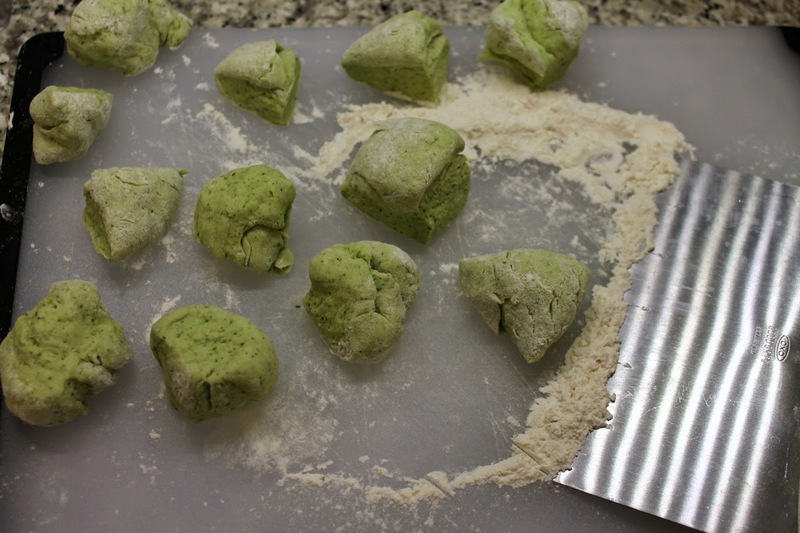 Finally, I made the dumplings in the food processor, which makes them turn green, not a bad thing, but if you want them more beige with green flecks, you should mix the dough by hand. 1. Pat chicken dry. Combine paprika, seasoned salt and pepper in a small bowl and rub mixture onto the chicken. 2. Heat oil over medium-high heat in a dutch oven or deep-sided sauté pan. Add chicken and brown on both sides, about 5 minutes per side. Remove chicken from pan. 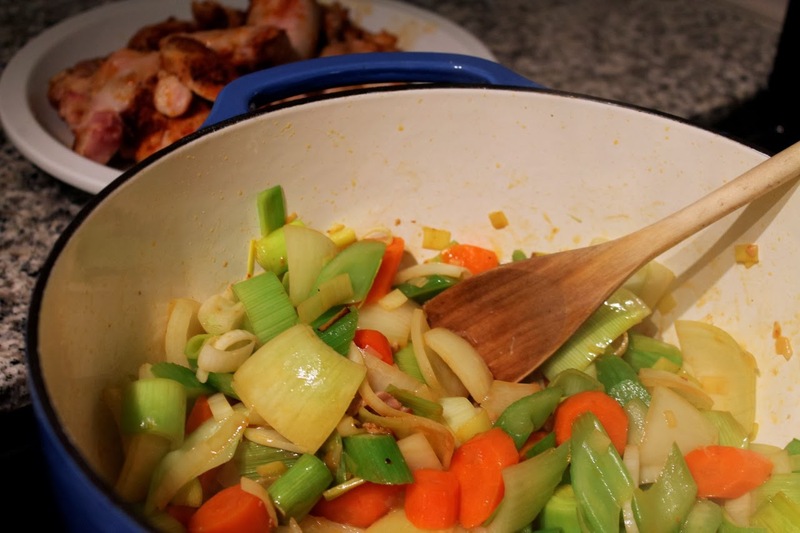 Add celery, carrots, leeks and onion and sauté until they start to brown, about 6 to 8 minutes. 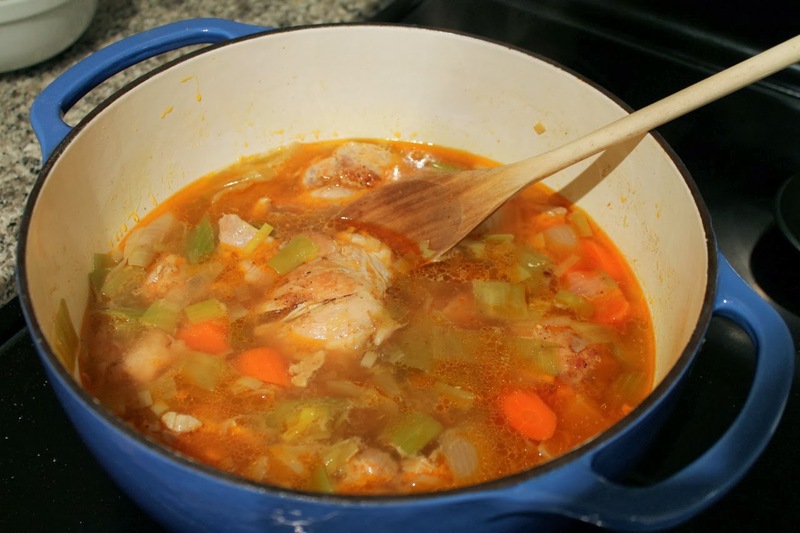 Return chicken to the pot, add the chicken broth and bring to a boil. Cover pot and reduce heat to simmer until the chicken is cooked through, about 30 minutes. 3. While the chicken simmers, make the dumplings: combine the flour, baking powder and pepper in a food processor and pulse to combine. Scatter the butter over the flour mixture and pulse until the mixture looks sandy. 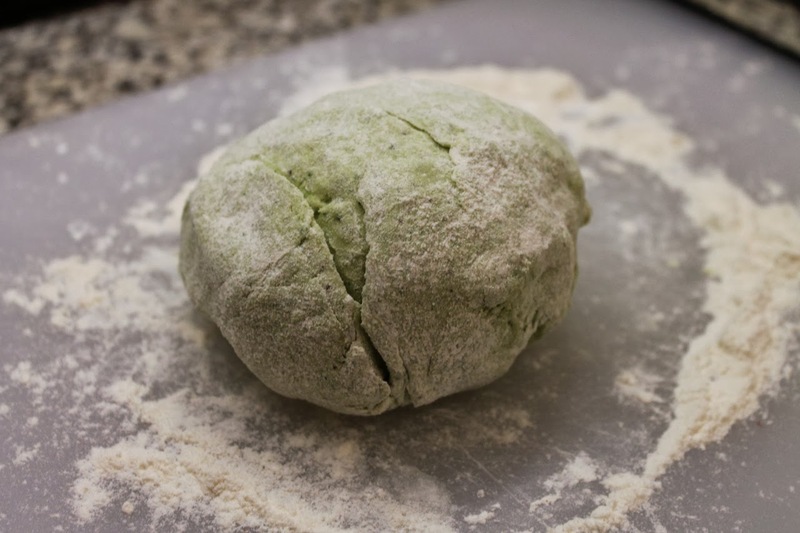 Add the parsley and milk and process until the dough comes together in a ball (add more milk if necessary). Turn dough out onto a floured work surface kneed it a few times. Cut the dough into 12 pieces. 4. Drop the dough pieces into the broth and cover the pot again. Continue cooking at a simmer until the dumplings are puffed and cooked through, about 15 minutes. Serve chicken and dumplings with broth in shallow bowls topped with a sprinkle of fresh parsley. I was wondering why the dumplings were green. Now I know. I've seen you use "The New Basics" a lot over the years. Great meals always come out of this cookbook.